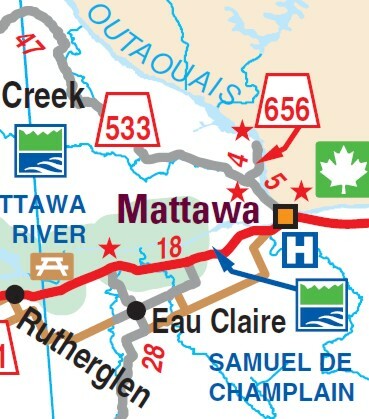 The township has no named communities within its boundaries; all addresses within the township are rural routes assigned to the neighbouring town of Mattawa. Pop. 30. In Renfrew C. on the Ottawa R. and Hwy 17, 34 km. E of Mattawa. Pop. 7. In Pentland T., Nipissing Dist. on the N shore of Kioshkokwi L. at the head of Amable du Fond R, in Algonquin Park at the terminus of Hwy 630,29 km S ofHwy 17, 53 km SE of North Bay. Pop. 2,332. In Papineau T., Nipissing Dist. at the junction of the Mattwa and Ottawa Rs. and Hwys 17 & 533, 62 km. E of North Bay. Pop. 104. In Nipissing Dist. on Hwy 17, 35 km. E of North Bay. Pop. 4. In Pentland T., Nipissing Dist. on the N shore of Cedar L. in northern Algonquin Park.